A dynamic anti-racist protest was held in Athens with the participation of about 5,000 immigrants, mainly from Pakistan. 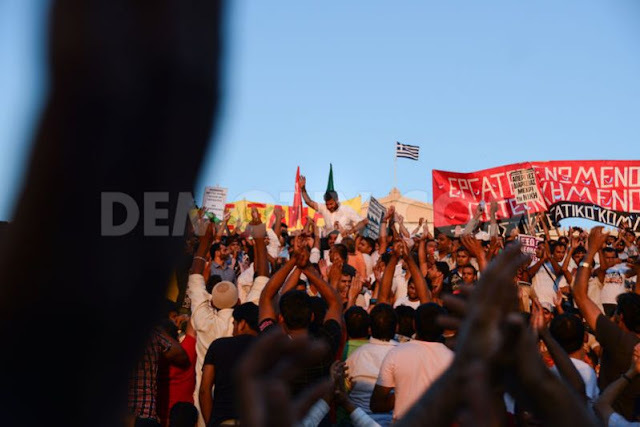 Their purpose was to protest the way they are treated, not only by members of the Golden Dawn, but also by the Greek state. Greece, 24 August 2012. Immigrants mainly from Pakistan hold banners against racist attacks and raise their hands, during a protest rally in Omonoia central square of Athens, Greece. Immigrants protesting against racist attacks in Stadiou Street. Immigrants hold banners against racist attacks and raise their hands, during a protest rally in Omonoia central square of Athens, Greece. Greek worker expressing solidarity with migrants in Omonoia central square at the beginning of the protest in Athens, Greece. 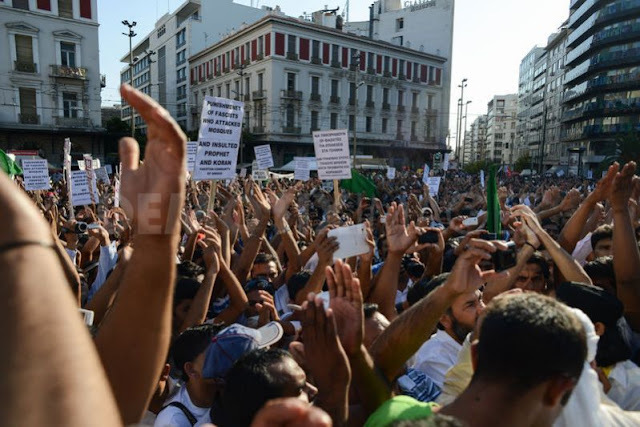 Immigrants protest holding banners against racist attacks and attacks on places of prayer, in Omonoia central square of Athens, during the speeches of the anti-racist rally. 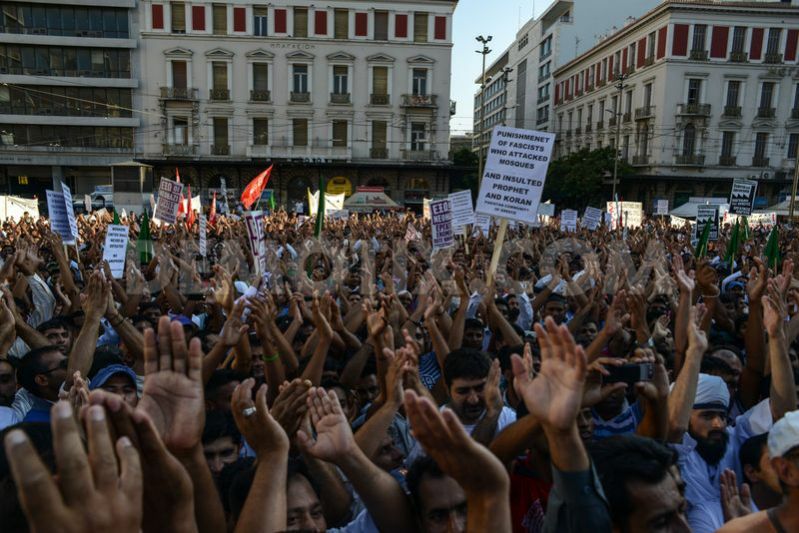 Crowd of migrants gathered in Omonoia central square of Athens, Greece, during the anti-racist protest rally. 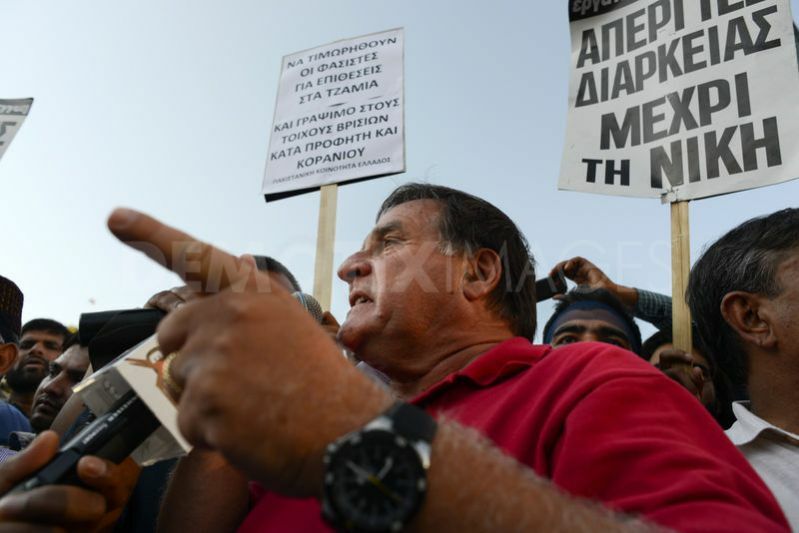 Syriza political party MP, Dimitris Tsoukalas, while speaking in Omonoia Square of Athens greece, during the anti-racist rally. 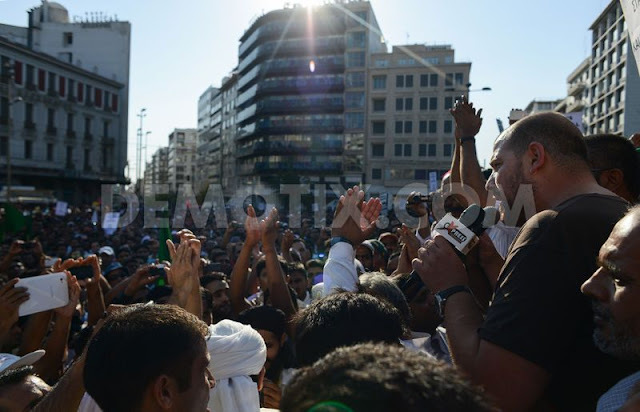 Mr. Petros Konstantinou (R), member of the Municipal Council of Athens City and representative the Movement "United Against Racism and the Fascist Threat", during his speech in Omonoia Square. Ms. Hala Akari, member of administrative council of European Forum of Muslim Women, addressing speech in Omonoia central square of Athens, Greece, during the anti-racist rally. 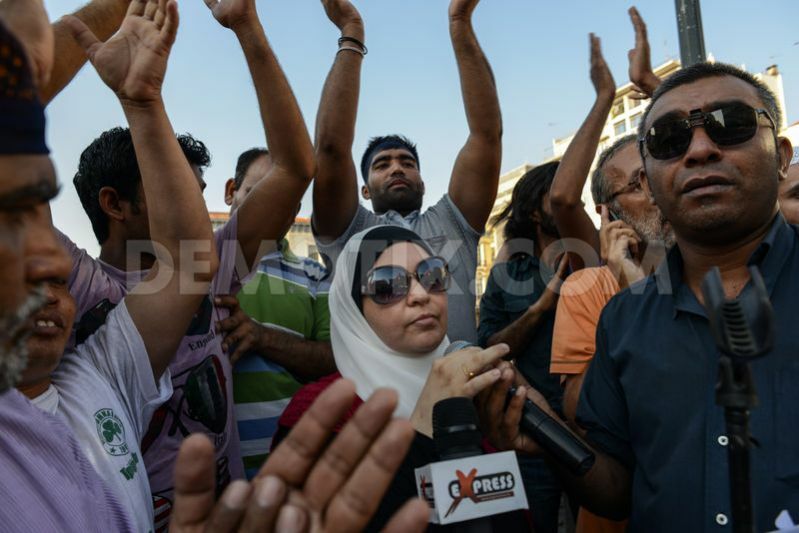 Protesters wrangle during a low intensity disorder occurred in the beginning of the protest in Stadiou Street in front of a Gold exchange office. 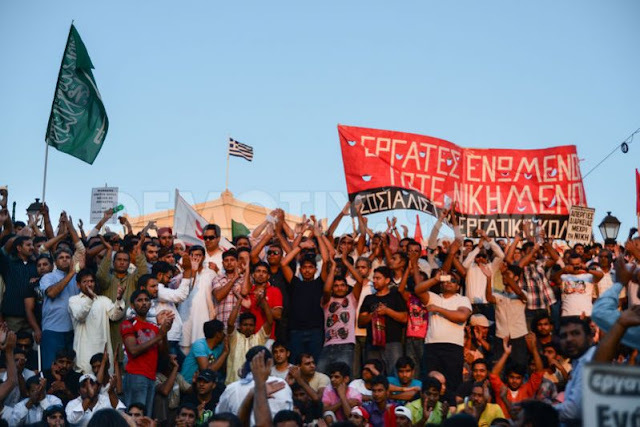 Immigrants protest holding banners against racist attacks and attacks on places of prayer, in Stadiou Street, Athens, Greece. Immigrants protest holding banners against racist attacks and attacks on places of prayer, in Stadiou Street, Athens, Greece. 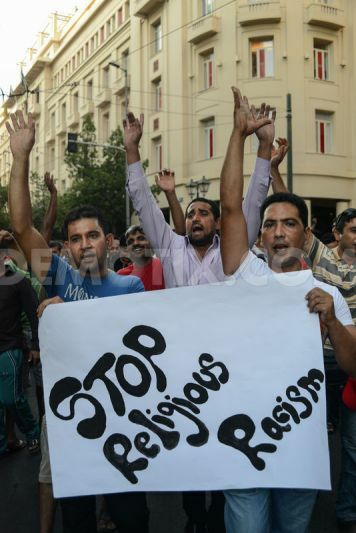 "Stop Religious Racism" banner reads. 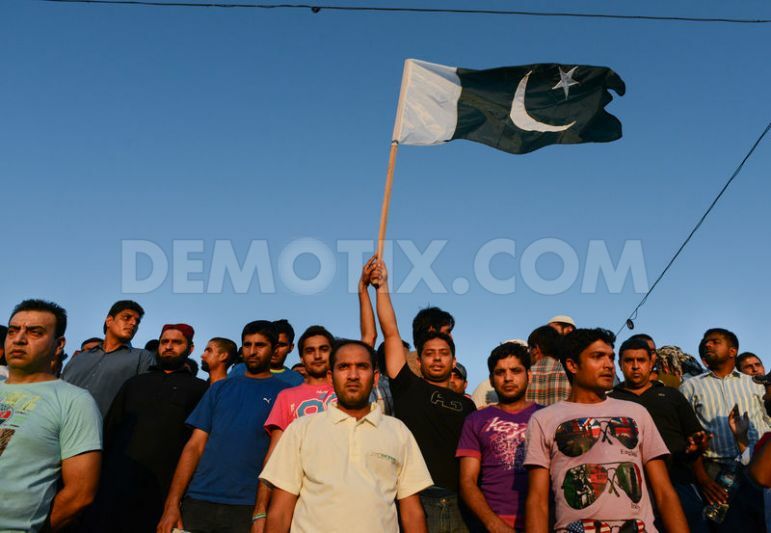 Pakistani migrants holding flag of Pakistan, protest for racist attacks and attacks on places of prayer, in Syntagma Square, Athens, Greece. 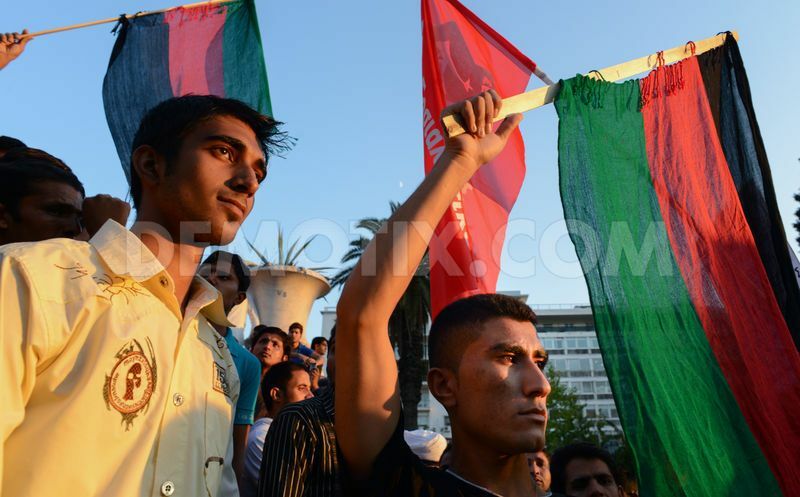 Afghan immigrants holding flag of Afhanistan, protest for racist attacks and attacks on places of prayer, in Syntagma Square. 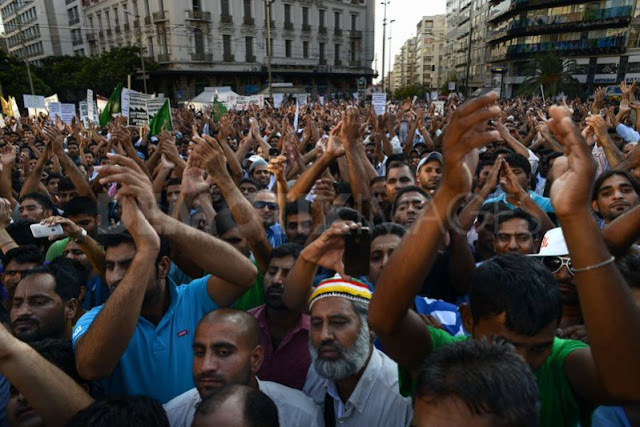 Pakistani protesters heft and acclaim the President of Immigrant Workers Union, Mr Javied Aslam, during the protest in Syntagma Square, Athens, Greece. 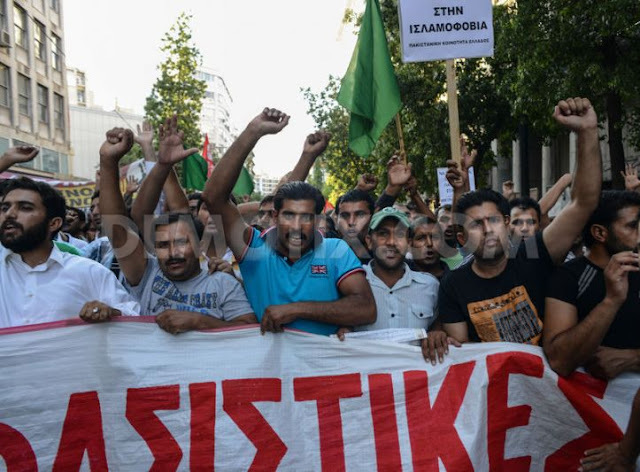 Immigrants and Greeks protest for racist attacks in Syntagma Square in front of the Greek Parliament. 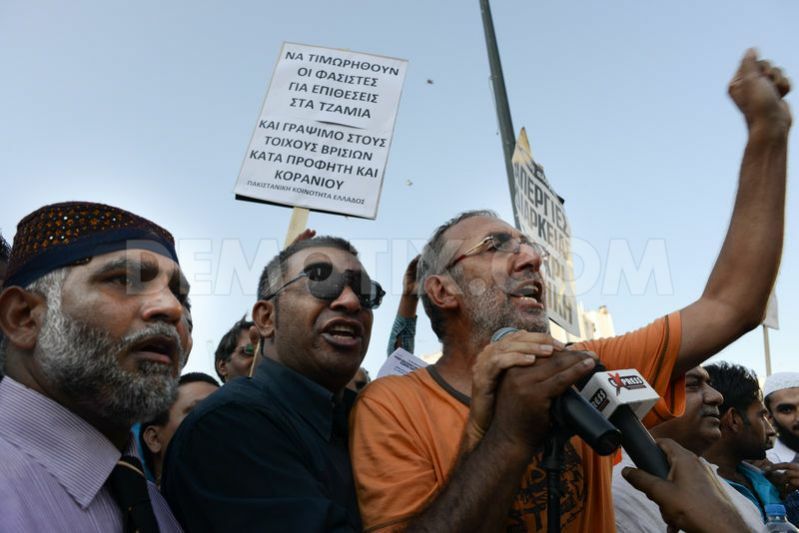 "Workers United, shall never be defeated" banner in Greek reads. 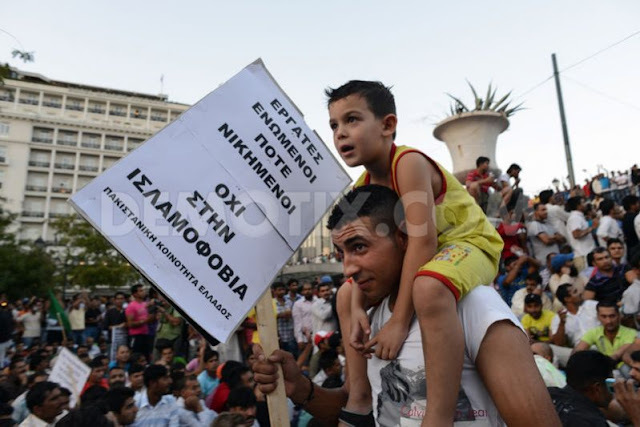 Young man and child protesters in Syntagma square holding a banner against Islamophobia. 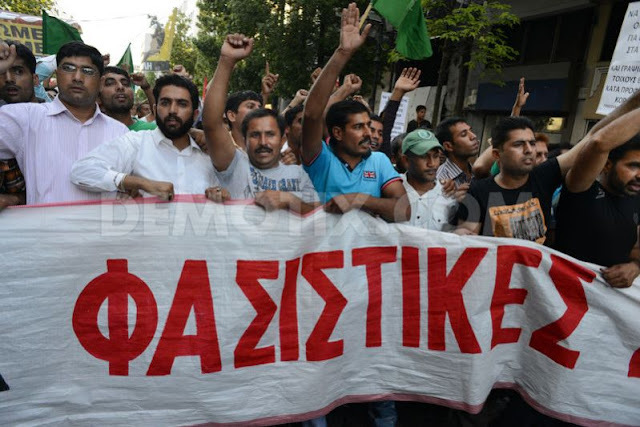 "Workers United, shall never be defeated" banner in Greek also reads. 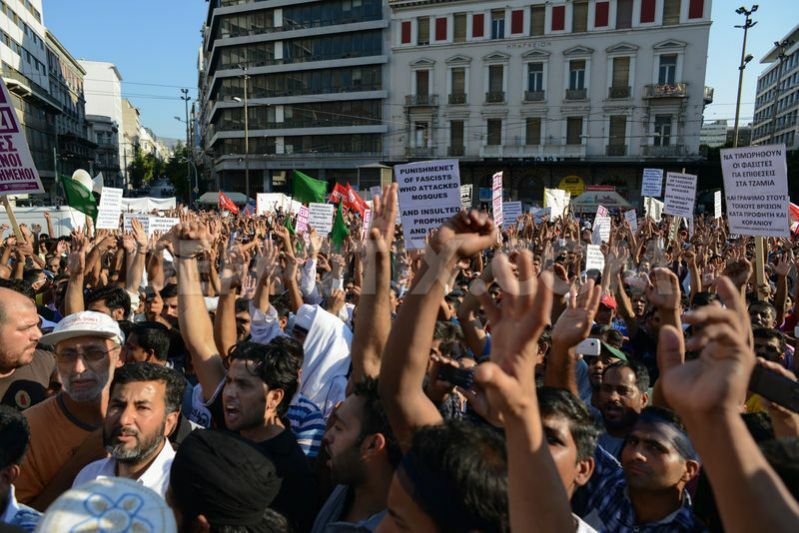 Protester in Syntagma square holding a banner against Islamophobia. 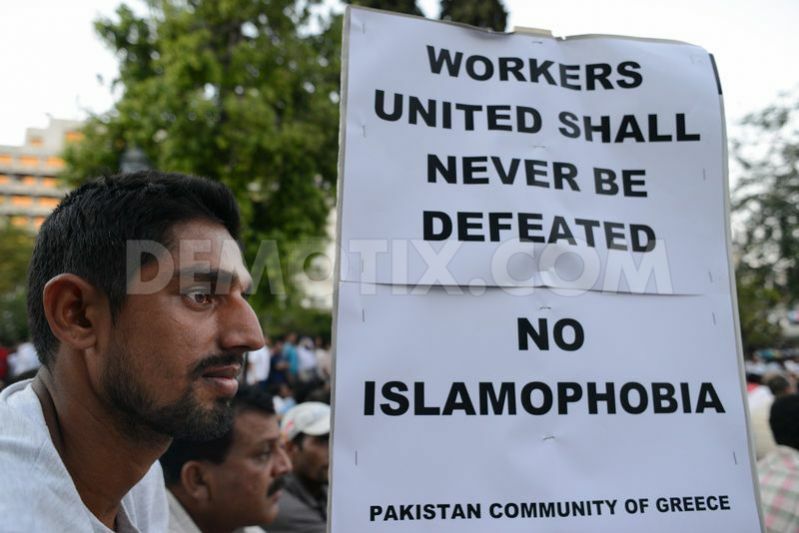 "Workers United, shall never be defeated" banner also reads. 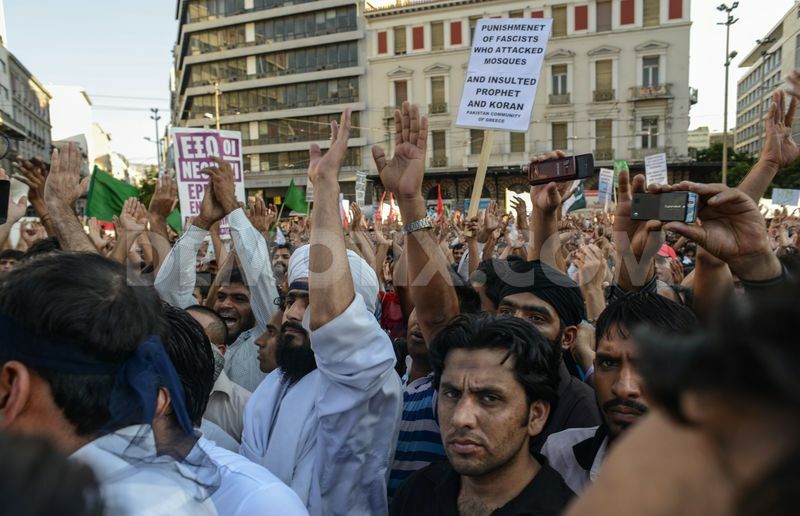 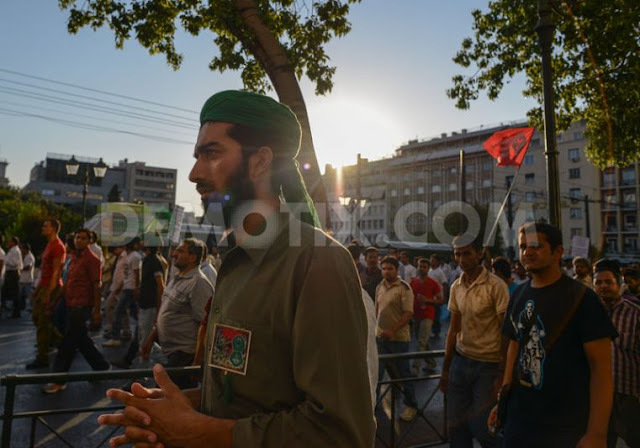 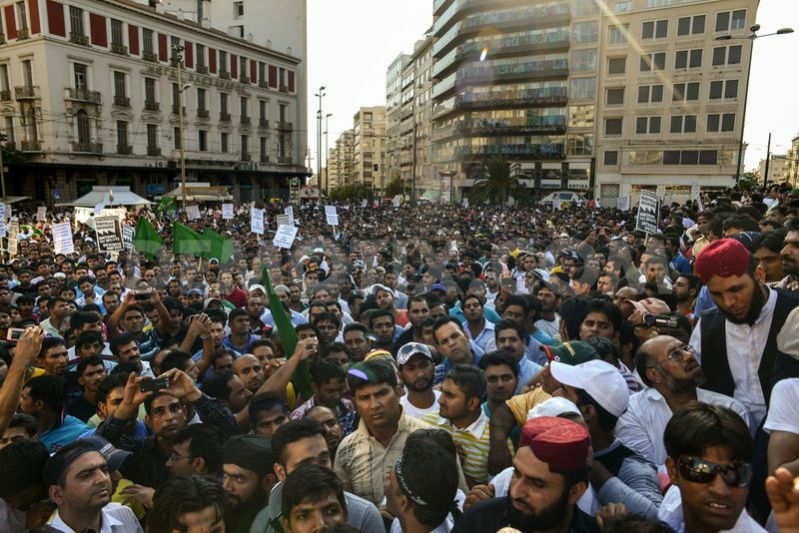 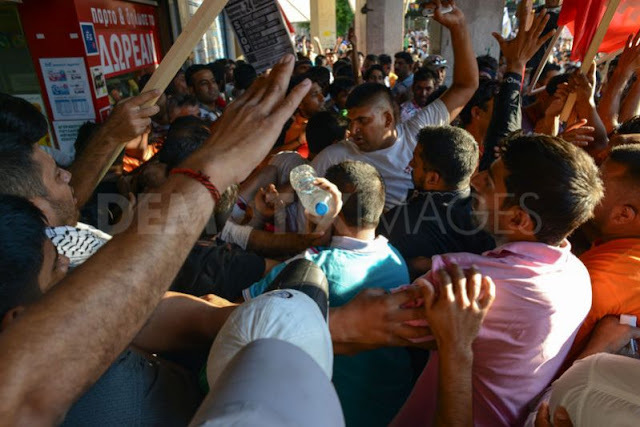 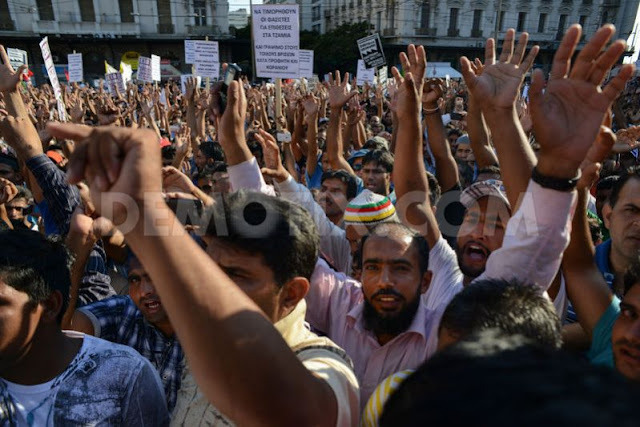 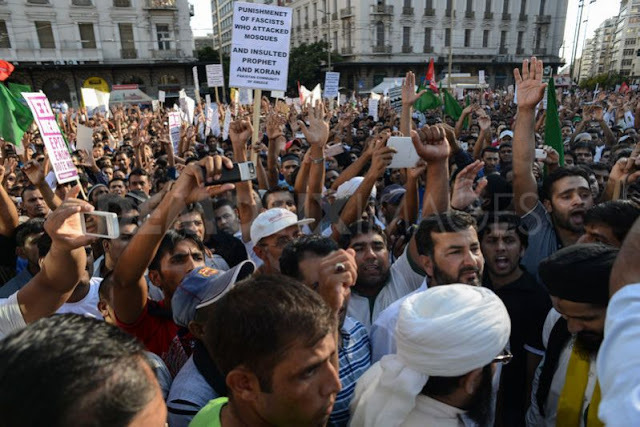 Pakistani migrants protest against racist attacks in Syntagma Square, Athens, Greece.